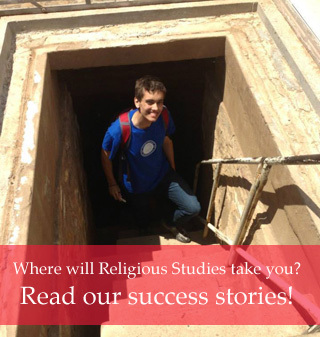 Declared Religious Studies Majors meet with the Undergraduate Director to determine a plan of coursework that both fulfills requirements for graduation and is appropriate to each individual student's interests and career goals. Majors should plan on meeting with the Undergraduate Director at least once a year to discuss their progress, plans and goals. Students seeking exceptions and substitutions to the requirements for the major or minor, as well as those interested in pursuing Study Abroad opportunities, should also meet with the Undergraduate Director. The Undergraduate Director is also available to provide students with career advising. Religious Studies graduate students meet with the Graduate Director to determine a plan of coursework that both fulfills requirements for graduation and is appropriate to each individual student's interests and career goals. Graduate students should plan on meeting with the Graduate Director at least once a year to discuss their progress, plans and goals. The Graduate Director will conduct a yearly evaluation of graduate student progress toward degree. Students seeking exceptions and substitutions to the requirements for the M.A. or graduate certificate, as well as those interested in pursuing travel and research funding opportunities, should also meet with the Graduate Director.